Eating at a table, surrounded by your family may seem as something as foreign to you as aliens. But it also might be something you are already doing. 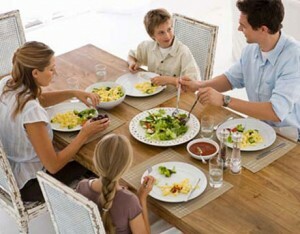 But studies are showing that there is a developmental and health benefit to having family dinner a few times a week. Also, when sitting around the dinner table, I was much more likely to get a better meal. When my parents cooked, I was getting some meat, vegetables, breads, milks, and other necessary daily vitamins. Eating around the table really provided a good baseline for nutrition. Now, was every meal a perfectly balanced nutritional masterpiece? Of course not. But you are allowed a few indulges every once in a while. While nutritional benefits are great, the social and relationships advantages are immense. Really, a family that eats together, is far better off than a family that doesn’t. Of course this isn’t an across the board statement. There are plenty of good families that don’t eat together and they survive. There are plenty of families that eat together all the time, that don’t survive. But, on average, it is a great things. When you take time to listen to your family, you form a strong bond with them. This is a great time to learn how everyone’s day went. A connection is especially important between spouses and children and parents. Both sides want the other side to listen and give feed back. Plans are made and goals can be set. Then, at a later time, they can be reevaluated and changes can be made. A sense of security and love can be formed. After a long day of work, or school, or watching the kids, or whatever…this time can help you relax. You sit back and enjoy each other’s company. You learn something and are others are listening to you. You can discuss the day and sort of release some bent up tension. Problems arise in families all the time. Dinner time can be a moment to identify the problem and make solutions. Skipping this moment can have lasting effects. A problem that could have been solved early in the process, no may take days and weeks to solve. This moment can provide time to discuss things like manners and behavior around the dinner table. Open discussion can happen on expectations and what worked and didn’t about a specific incident or moment. Often we are busy with sports, homework, television, or something else. Eating time provides a few moments where important things can happen. Dinner time is a great time to laugh and enjoy what others are saying. Jokes and fun times are routine around the dinner table. My own children love to hear my work stories and the awesome things that happen. More than once, I’ve had milk pouring from my nose on the funny things that they have said. Overall, eating together provides both mental and nutritional well being. It can be overstated the importance of that time that is spent. Often, if used in a good way, then more than just a good meal can occur. Opportunities to try new food and get input from your children is priceless. Eating together is such a good boost to your health. Don’t miss this chance.